My comfort food is soft, chewy homemade cookies. And in very stressful times of my life, I tend to eat a lot of them. 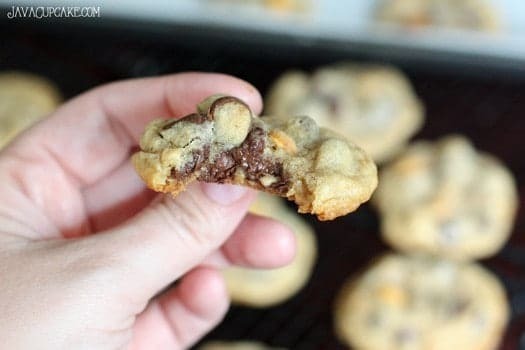 These Salted Caramel Peanut & Chocolate Chip Cookies are the perfect salty, sweet and chocolate cookie sure to cure any of life’s cravings. Sign up for my newsletter and never miss another post or recipe… SIGN UP HERE! These cookies may look like any other cookie, but trust me they aren’t. 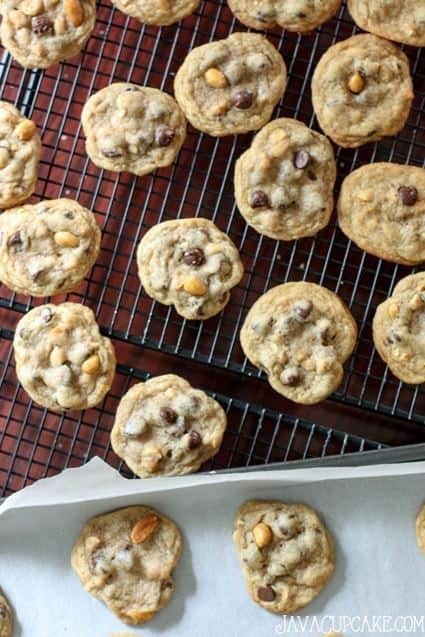 Chewy in the middle, firm on the outside are the familiar textures of a great chocolate chip cookie, but what makes these cookies different is the addition of sea salt and Salted Caramel Peanuts! When I saw the can of the Planter’s Salted Caramel Peanuts on the shelf at the commissary, I knew they’d be the perfect addition to a chocolate chip cookie. 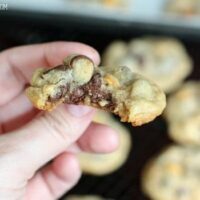 They add a delicious amount of salty sweetness and a bit of a crunch that turn these cookies up a notch. 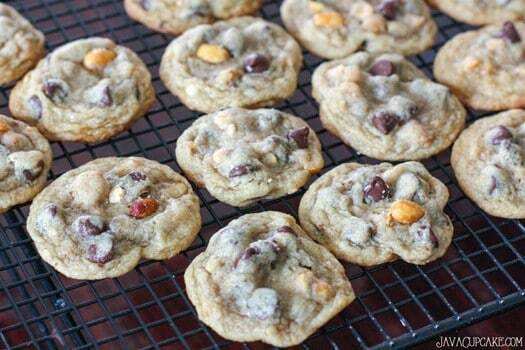 Seriously, these Salted Caramel Peanut & Chocolate Chip Cookies are OUT OF THIS WORLD delicious. I’ve made 4 dozen of them…. twice in the last month. Yeah, we needed that many and yeah, they’re that good. Try them, you don’t be disappointed! In the bowl of your stand mixer, cream together the butter and sugars until fluffy. Add the egg and vanilla and beat on high for 2 minutes. Make sure to scrape the sides and bottom of the bowl to ensure everything has been incorporated. In another bowl, stir together the flour, baking soda and salt then add this to the butter/sugar mixture. Mix on medium speed until incorporated. Add the nuts and chocolate chips and mix on low until combined. Chill in the freezer for 90 minutes. Preheat oven to 375 F degrees and line baking sheets with parchment paper. Scoop 1" balls of dough onto the baking sheet leaving 1 1/2" between each. Sprinkle a small amount of sea salt onto the top of each ball. Bake 8 minutes or until golden brown. DO NOT OVER BAKE. Allow to cool on the sheet for 1 minute before removing to a wire rack to cool completely. Planters Salted Caramel peanuts….wha?! I need these cookies and those peanuts!! I have some of those peanuts in my pantry…what a delicious way to use them!! 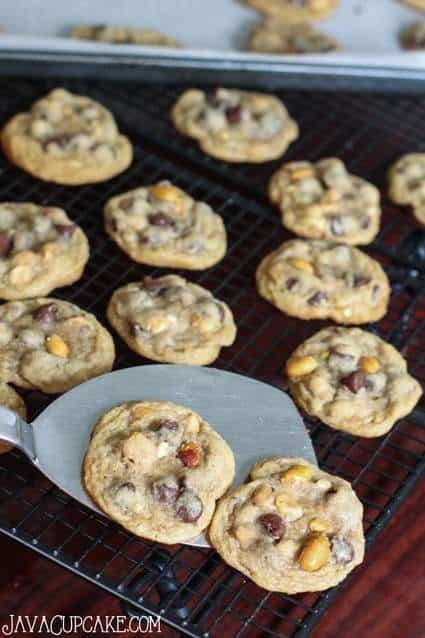 Love the peanuts in these cookies, great idea, for more texture and flavor! Those salted caramel peanuts are so addicting…I might have polished off a container all by myself. And in cookies…heaven help me!!! Those cookies sound amazing! omigosh these are like-everything. I want to gobble up 10 of them! !